Geri Jewell – Blair’s Cousin — Facts of Life — a Lesbian. Home → Damien Zone → Geri Jewell – Blair’s Cousin — Facts of Life — a Lesbian. Edna’s edibles might have had a deeper meaning when the girls were filming The Facts Of Life back in the old days of late 1970s-early 1980s TV. 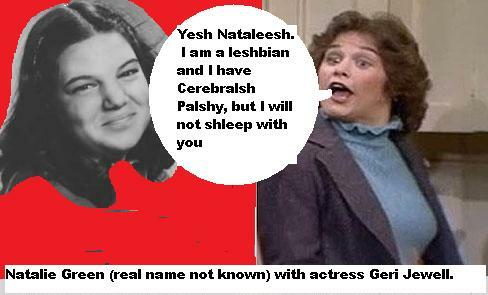 While Joe Polniaczek’s real persona Nancy McKeon has spent decades dodging rumors of lesbianism, it turns out that that Blair Warner’s cousin Geri — the one with cerebral palsy — was the lesbian all along. That doesn’t mean that Jo is in the clear — let’s make that clear right here. “It’s nothing to get all bent out of shape about,” said Mrs. Garrett, the head of the school where the girls all went to school. The actress, best known for her role in the 80’s sitcom ‘The Facts of Life’ and her numerous turns on Broadway, reveals her lesbianism in her new book, ‘I’m Walking As Straight As I Can,’ to be released soon. She will be doing book signings all over the USA but the lines will be long because it takes her a while to open the book and sign it — so bring your pup tent. The title doesn’t just refer to her sexuality, however — she also discusses her difficult struggle with cerebral palsy, and the difficult obstacles she had to overcome to make television history as the first recurring role played by a person with a serious disability. She had to not only overcome the twists and turns of the industry, she had to overcome the twists and turns in her head and neck and arms. Things got tougher still — the book talks about her money problems, backstabbing agents, substance abuse and eventual recovery. One source tells about a true horror story. Farting illegal in African country Malawi.